Studies have shown that kinaesthetic learning, where a student carries out physical hands-on activities rather than listening to a lecture, will help them gain a better understanding of the study material, in addition to regular classroom learning. 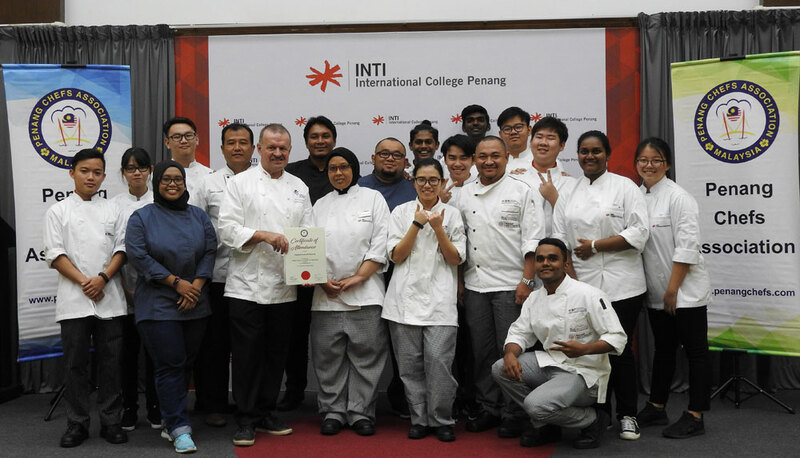 With this in mind and to enable students from the School of Hospitality and Culinary Arts (SOHOS) to have a strong grasp of culinary skills , a culinary workshop by renowned and globally acclaimed master chef, Dr Rick Stephen, was organised at INTI International College Penang (INTI). Excited INTI students posed for a group photo with their honourable guest trainer, Dr Rick Stephen (3rd from left in front row). Dr Rick Stephen, the Continental Director for Asia for the World Association of Chefs’ Societies (WACS), an organisation spanning 21 countries, has been conducting WACS approved courses since 2011 and was appointed to oversee the WACS Global Chef Competitions worldwide. Besides that, he is also a Corporate Chef for SATS, the chief ground-handling and in-flight catering service provider at Singapore Changi Airport. The workshop, which was co-organised by INTI and the Penang Chefs Association, drew a great number of eager learners from all over Malaysia, which included INTI’s culinary arts students who enjoyed free admissions to this once-in-a-lifetime learning session. “Apart from the theories and practical knowledge that students gain from their lecturers in their daily classes, this opportunity enabled them to gain direct exposure and insights into the culinary world at large, and to learn from an established global chef,” explained Christine Khoo, Head of SOHOS. This learning opportunity, she shared, complemented the efforts of SOHOS in providing students with a holistic learning experience, and empowered them to strengthen their technical skills in a variety of practice settings. A certificate of appreciation is presented by the President of the Penang Chefs Association Chef, Audee Cheah (2nd from left) to the Head of INTI’s School of Hospitality and Culinary Arts, Christine Khoo (centre), witnessed by Dr Rick Stephen (1st from left), Academic Director at INTI Penang, Goh Wai Meng (4th from left) and INTI Penang Chef Lecturer, Chef Yuzrem. “As the event also welcomed representatives from the Penang Chefs Association as well as practitioners from this growing industry, it provided our students a solid ground for networking with their future counterparts. Through regular sharing sessions, workshops and showcases like this, INTI provides vast opportunities for undergraduates to keep abreast of the latest industry trends and learn from the professionals at the forefront of Malaysia’s hospitality industry,” elaborated Khoo. The workshop included hands on training on the best way of cutting up and serving poultry, the most popular meat served in almost every cuisine, a professional gelatine glazing method and the best way to cook pasta, all of which was personally demonstrated by Dr Rick Stephen. Inspired and enlightened by the overall experience and the opportunity to meet so many professionals, INTI students also received certificates of attendance from Dr Rick Stephen, an invaluable addition to their portfolios and future careers. 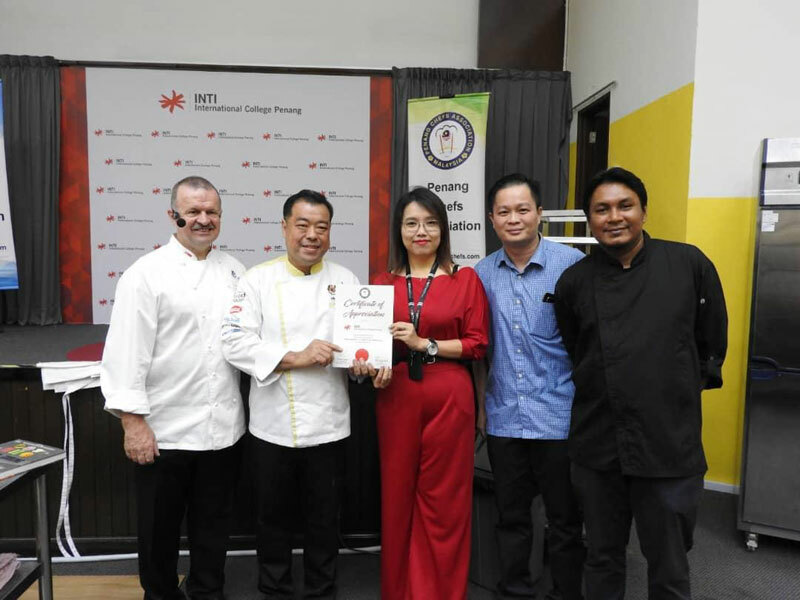 “We are honoured to have co-hosted this event alongside the Penang Chefs Association and for welcoming both local and international professionals to our campus. Through such opportunities, we provide our students an edge in their careers as they receive the training they need, even before entering the workplace. In industries such as Hospitality, these learning opportunities are truly invaluable as they expose students early to the expectations of the industry and give the hands on experience they need – a skill which is even more valuable than theories in today’s workplace,” concludes Khoo.